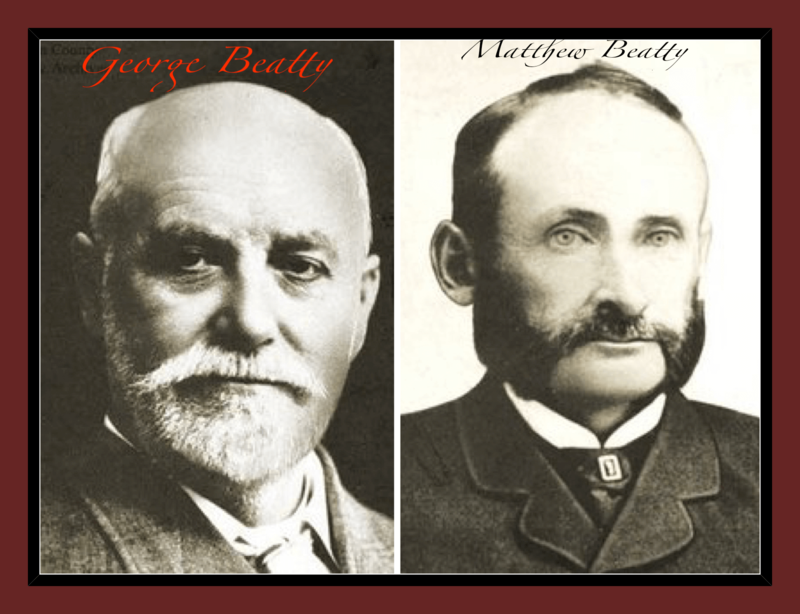 Beatty Brothers Limited was established in Fergus, Ontario in 1874 by George and Matthew Beatty, of Irish descent. George, born in 1845, had left the family farm at age 18 and apprenticed at an implement manufacturer specializing in grain threshers. Not satisfied with the product, he and his brother Matth ew started their own implement business in Fergus in 1874; George being the inventor and Matthew doing the selling. In its earliest years the company was primarily a family business involved in the manufacture of farm equipment. George’s reaper was awarded a medal for engineering excellence and superiority in the field during competition at the Toronto Industrial Exhibition in 1879. This recognition created new demands for Beatty manufactured reapers, mowers, straw cutters, land rollers, single and gang plows, and they even sold stoves and cast-iron kitchen utensils. During this period the brothers purchased the Grindley farm implement factory with water power on the Grand River. When Matthew died unexpectedly in 1886, George carried on alone; his two sons, Will and Milton, growing up on the farm and spending holidays at the factory. In 1900, with a bold management move; the enterprising George Beatty ceased manufacture of farm implements and began manufacture of barn equipment. This new line allowed renewed opportunity for his inventive genius. In 1901 both of George’s sons completed studies at Toronto University and entered business with their father. Beatty had been marketing hay trolleys since the early 1890s. The flurry of purchases of other manufacturers that followed shows George and his sons were serious about competing in that arena. Notably the James Provan Company of Oshawa in 1904, Whitman and Barnes of St. Catharines in 1906, Cameron and Dunn of Strathroy in 1908, Tolton Bros. of Guelph and Emerson & Campbell of Tweed in 1909; were purchased along with all patent rights. The company boasted their competitive edge was a result of buying raw materials in rail carload quantities and employing state of the art factory equipment to reduce labor costs. Priding themselves as humanistic employers, the new generation of Beatty brothers sold employees real estate lots at a modest price which were adjacent to the expansive manufacturing and farm lands on the edge of Fergus. They also financed employee loans for the purpose of building houses. It was said that even though employees worked a ten hour day in those times; few even brought their lunch because they lived so close to the plant. By 1930 the Beatty name boasted over 600 items and the brothers had wisely diversified the product line to ensure future profits. Factories in Fergus and London, Ontario employed 600 people, and an additional 800 people were employed in Great Britain. There were branches and stores across Canada and by 1939 stores had expanded into Australia and New Zealand. History documents that many others had a somewhat different opinion of the “morally uprighteous” Beatty family! It is said the new generation of brothers were, like their father, “against the evils of drink, dancing and flirtatious behavior.” As the plant grew, so did the Beatty influence over the village of Fergus. The family’s control over Fergus and its employees continued until World War II. With many of the factory force going off to war, young women from across Canada replaced them on the production line. This “new generation” did not bow to the strict Beatty social guidelines. The women earned less than half what the men they replaced had been paid. The women, making up one third of the Beatty workforce; assembled shell boxes, primer shells, and gun turrets for warships. Conflict grew with management. The Beatty newsletter referred to them as “factoryettes” and “foundryettes.” By the end of the war unions had organized the factory and the office. Fergus residents voted to allow the sale of alcoholic beverages. Home appliances, once a staple of Beatty output, were forbidden to be manufactured during the war unless going to support the war effort. Production lines had been retooled to support the war effort. This impacted post-war production and compounded by the British Empire’s slow recovery after the war, Beatty never regained the trade they had enjoyed with pre-war Britain. After the war, many Canadian retail stores closed; also impacting Beatty sales. Although never as successful as pre-war, Beatty Brothers continued production, mostly with sales of home appliances. In 1961 the company was sold to General Steel Wares.